This is our guide on how to defeat Gyoubu Oniwa, AKA. the horse boss of Sekiro: Shadows Die Twice. 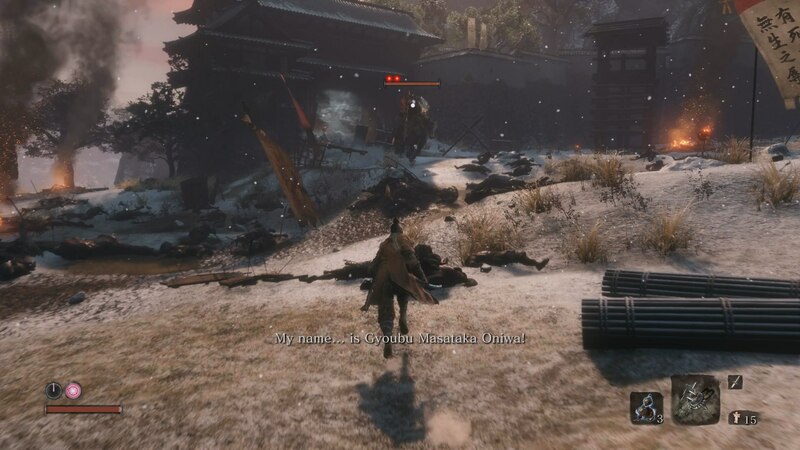 Gyoubu Oniwa is the name of the first main story boss in Sekiro: Shadows Die Twice, and he can be pretty difficult to understand. 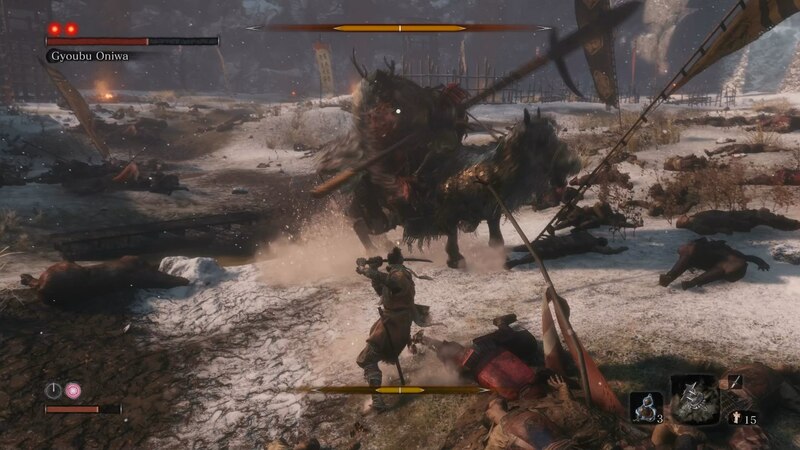 In our Sekiro Gyoubu Oniwa boss guide, we'll be walking you through how to beat Gyoubu Oniwa as easily as possible in Shadows Die Twice. If you're just here for the absolute essential tips on how to beat Gyoubu Oniwa, then look no further than our list below. You want to try and stay close to Oniwa at all times. There's no jumping over his sweeping attacks, so it's time to put your deflecting skills to the test. Oniwa's attacks are always chained together in at least groups of three, sometimes four. If you hit the head of the horse enough, the boss will stagger. If Oniwa rides away from you, a white marker for your grappling hook will appear on him. Race towards him to grapple up close and dodge his attack. Your nearest Sculptor's Idol to this boss fight is the Ashina Castle Gate Fortress Idol. You'll know you're about to enter the arena with this boss, when you're looking down on a field of carcasses, of warriors and horses alike. Head into the middle of the battlefield, and Gyoubu Oniwa will ride out to meet you. As soon as Oniwa reaches you, he'll wave his spear in the air a few times. Use these precious seconds to lay into him for a few cheeky attacks. When the fight gets going though, you'll notice that Oniwa will generally skirt the area around you on horseback, moving his spear in big, sweeping arcs around him. We hope you've been practicing parrying. The aim of this boss fight is to stay close to Oniwa, at all times. The further Oniwa gets away from you, the more likely it is that he's going to charge up a brutal attack, skewering Wolf if it lands. So, you need to stay close to Oniwa, but get ready to parry multiple attacks in a row. Oniwa won't get staggered if you parry just one of his attacks, and he can easily chain together two or three attacks in a row. The goal here is to successfully parry attack after attack. If you can pull this off, Oniwa will be left temporarily staggered for a split second, in which you can go in for a quick one hit. The goal of this entire fight is to get Oniwa's stagger meter up to maximum. Successfully parrying his attacks is your best option for doing this as quickly as possible. One tactic is even to not actually attack Oniwa, but just keep repeatedly parrying his attacks, until his stun meter maxes out. Once this happens, you can go in for the Deathblow. Do this twice, and your mission of beating Gyoubu Oniwa will be over. One thing to note is that whenever a green marker appears on Oniwa, you need to immediately press the left trigger. Doing this will zip Wolf over to Oniwa, but will also stagger Oniwa out of the attack that he was charging up. You need to constantly be on the lookout for this green marker, and it generally only happens when you're a certain distance away from the boss. 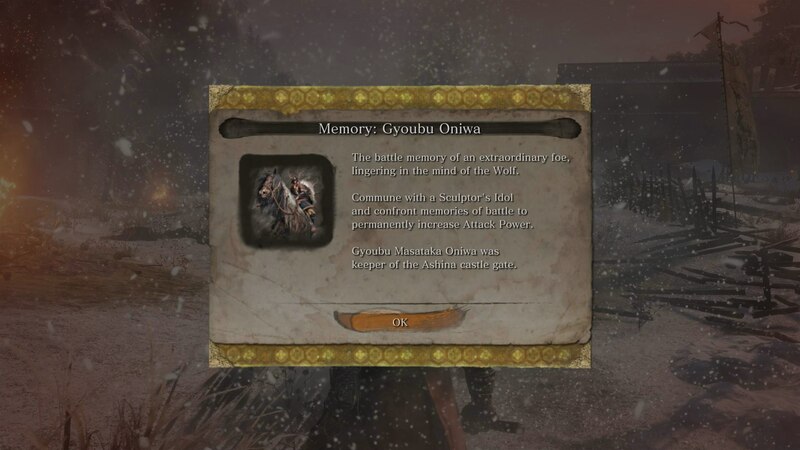 After the battle, you'll gain a unique memory item relating to Gyoubu Oniwa. Take it back to the nearest Sculptor's Idol, and use the memory to permanently increase your attack power. Outside of this, you can also take the Mechanical Wrist Barrel item that you got from Oniwa back to the Sculptor, for a nice upgrade to the Shinobi Prosthetic. 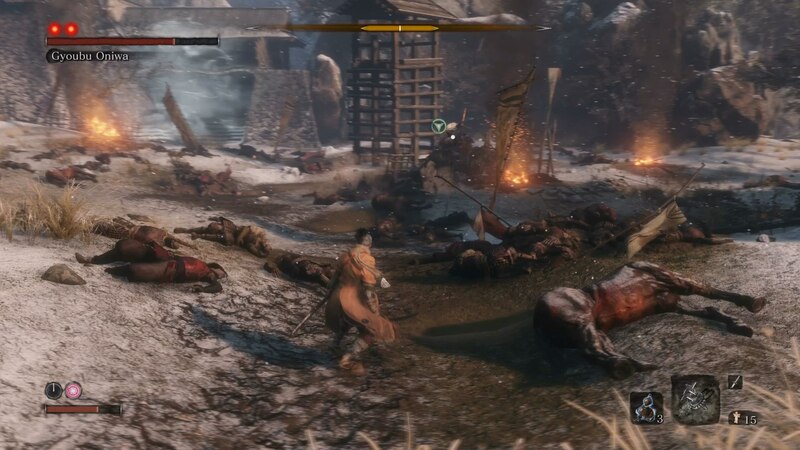 There's actually a method in Sekiro that allows you to entirely skip Gyoubu Oniwa. If you jump onto the wooden tower by the far wall, to the right of where Gyoubu Oniwa enters the arena, you can actually jump to the nearby wall, hanging from it, and then pulling yourself up and over the wall, skipping the fight entirely. But if you still want to fight Gyoubu Oniwa, then bring the Firecracker. Simply spam the Firecracker right in his face, let loose with a few attacks, deflect the attacks that he responds with, and this fight will be over in no time at all.